For those who want to spend time in the great outdoors the Barra del Chuy Beach is one of the destinations that should be at the top of their itinerary. Today the entire region surrounding the city of Chuy Uruguay remains a place where outdoor adventures are certainly the main attractions. This is a location that appeals to anyone who prefers adventures that include walking, hiking and sightseeing and taking several Uruguay attractions. Barra del Chuy Beach is a picturesque oceanfront setting where the long expanse of sandy shoreline is the perfect site for viewing the many wonders of nature. The sunsets at this Uruguay beach are spectacular with dazzling colors that paint the horizon's sky with a myriad of vivid hues. This beach extends from Uruguay to Brazil and a visitor can explore the Coronilla Beach along Uruguay's border or venture further along the seashore and stroll the sandy coast of Barra del Chuy. For those visitors that have become accustomed to the hubbub and noise present at many other beaches in Uruguay such as La Rambla and Brava the quiet and serene environment can be a stunning and welcome change. These wonderful Uruguay beaches are located a little off the beaten path and this helps ensure that they are not excessively crowded during the warmer summertime months. Many tourists come to the Barra del Chuy and Coronilla beaches just to discover the amazing array of wildlife that live along the coastline such as sea turtles, yellow clams, and thousands of colorful birds. 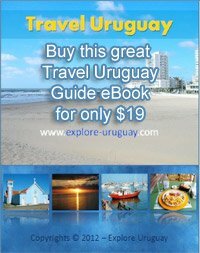 You can stay at one of the nearby hostels or hotels in Uruguay which will give you easy access to a number of other tourist attractions in addition to the beaches. There is the Fuerte de San Miguel which is an ancient fort that still remains standing. The Cerro Picudo is another Uruguay attraction near this beach where many visitors can enjoy exploring a protected nature preserve. At the Cerro Picudo there is a hill where a herd of cattle can be seen grazing peacefully. These cattle are the descendants of a breed that was first brought to Uruguay during the 16th century by the Spanish explorers. The landscape at Barra del Chuy Beach is filled with wide expanses of sparkling sandy shores, tall gracefully swaying trees and green hillsides. Overhead the bright sunshine helps transform Chuy into a natural paradise for the people of Uruguay and visitors who want to spend the day hiking through the countryside or marveling at the beauty and power of the Atlantic Ocean.